Rush’s YYZ has a section at 2:25 that is Phrygian and Phrygian Dominant guitar scales. The basic chords are B-C which lead guitarist Alex Lifeson interprets as both Bm-C in B Phrygian mode and B-C in B Phrygian Dominant. B Phrygian is the 3rd mode of G major scale and B Phrygian Dominant is the 5th mode of E harmonic minor scale. So you can play either G major or E harmonic minor scale patterns over the progression, just be sure to center your playing on the tonic pitch, B. The difference in these two scales is the D note. In B Phrygian the D is natural but in B Phrygian Dominant the D is sharp. In B Phrygian the D natural makes the tonic chord minor (Bm: B-D-F#). In B Phrygian Dominant the D# makes the tonic chord major (B: B-D#-F#). 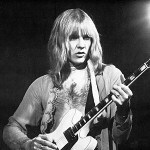 Lifeson used both pitches for his guitar solos. 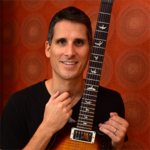 You can play along, improvise and compose your own guitar solo using both D and D#. Try recording yourself playing the B-C chord progression with just power chords (roots and 5ths, no 3rds). This way you can interpret the B as either major or minor. Then, jam away with Phrygian and Phrygian Dominant! The modes of the major scale including Phrygian mode and the fifth mode of the harmonic minor scale, Phrygian Dominant, are covered in my Fretboard Theory guitar theory program. Love the post, just tweeted it! I remember spending so much time working on the rhythm for the opening riff to this song when I was a teenager. It’s been so long since I looked back at the guitar solo and never stopped to notice the cool modal sounds Lifeson is playing with. Thanks for the breakdown! Great post and great song!! I LOVE the flat second in the phrygian mode. Makes for crazy sounding stuff. Thanks for this, looking forward to more.